Six years ago today, sixteen infants in China’s Gansu Province were diagnosed with kidney stones. All of them had been fed milk powder that was later found to have been adulterated with a toxic industrial compound called melamine. Four months later,an estimated 300,000 babies in China were sick from the contaminated milk, and the kidney damage led to six fatalities. The Sanlu Group, one of the largest dairy producers in China, was identified as the chief culprit. But as the scandal unfolded, more Chinese dairy firms became implicated. The incident not only damaged the reputation of China’s food exports, but also dealt a devastating blow to the booming domestic dairy industry, leading to a series of mergers and consolidations. The inelastic baby formula market boosted the demand for foreign products—indeed, after 2009, more than 100 foreign brands flooded into the Chinese market. In hindsight, it is not an overstatement that the 2008 incident is one of the largest food safety scandals in PRC history. The scandal lays bare China’s failure to build an effective regulatory state in its transition to a market economy. Drawing lessons from the crisis, the government sought to strengthen its regulatory capacity in food safety control. In June 2009, China promulgated the Food Safety Law, which prohibits any use of unauthorized food additives. The law also led to the establishment of a high-profile central commission to improve inter-state coordination and enforcement of food safety regulation at the national level. In March 2013, China Food and Drug Administration (CFDA) was set up as a ministry-level agency to consolidate authorities in food and drug safety. These measures, while important and necessary, have not led to significant improvement in China’s food safety. At the State Council Food Safety Commission meeting in January 2013, Premier Li admitted that while food safety has improved, “there are still a great deal of outstanding problems and potential hidden dangers; the situation remains grim.” China’s efforts to address food safety are complicated by new environmental health hazards, such as pollution of water and soil. Rice and garden vegetables contaminated by heavy metals poses major health risks, but the cleanup is highly costly and may take decades. Consumer confidence in Chinese dairy products remains extremely weak. 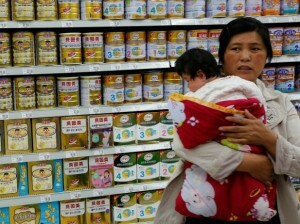 Official media suggests that over half of the Chinese baby formula market is dominated by foreign brands, and in some cities, the share is as high as 80 percent. In a desperate and bizarre move to beef up the domestic dairy industry, China issued a new regulation that banned the import of dairy products from unregistered overseas manufacturers. In recognition of the challenges, the government leaders over the past months have upped the ante for food safety. In March, Premier Li Keqiang used the melamine scandal to argue for “the strictest possible oversight and accountability” and “toughest possible punishment” in safeguarding food safety. Under Li’s blessings, China last week unveiled the draft amendment to the 2009 Food Safety Law. Dubbed “the strictest food safety law in history,” the new version has raised the bar of food safety management and provided more explicit requirements for government agencies to follow in the food supply chain. But how effective these efforts remains to be seen. Since the regulation of food safety incorporates several mutually reinforcing activities (production, marketing and consumption) and involves various stakeholders (e.g., manufacturers, traders, consumers, governmental actors), it is highly unlikely that pure top-down, state-centric regulatory and legal frameworks will be sufficient to defuse China’s food safety crisis. In order to achieve robust and sustainable regulatory capacity, the government should invest in the building of a vigorous civil society and a free and socially responsible media, which would serve as sources of information and discipline in enforcing food safety laws and regulations. It should be committed to the building of an independent court system to protect the food safety legal framework from being hijacked by self-serving bureaucrats or other vested interests. It should also be serious about establishing a code of business ethics at corporate and individual level to keep the “capitalism without ethics” in check. Such institutional support, as a demonstrated in my recent book, will enable China to build its regulatory state from more solid ground. ‡This article originally appeared on the Council on Foreign Relations’ Asia Unbound blog and can be found here.